This 62-year-old female presents with a left wrist mass that has recurred five times after two prior drainages and two prior surgical removals. Q1 – What is your diagnosis? Q2 – Why do you think this abnormality continues to recur? Q3 – What is the most likely origin of this mass in the wrist? 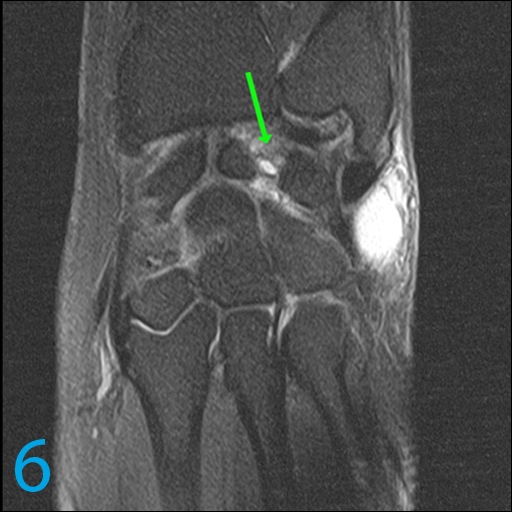 Q4 – What is the source of this abnormality? Q5 – How do a ganglion, a perimeniscal cyst of the knee, and a paralabral cyst of the shoulder, associated with meniscal and labral tears, differ histologically? A2 – The site of weakness or source of the mass has not been addressed. 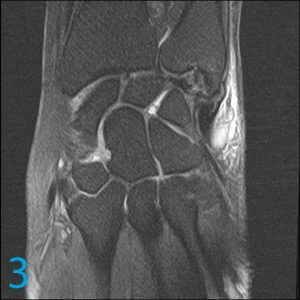 A3 – The dorsal scapholunate capsule, usually near or proximal to the dorsal intercarpal ligament and / or dorsal long radiolunate ligament. A5 – They are identical. It is the site of origin that differs. A ganglion, a perimeniscal cyst of the knee, and a paralabral cyst of the shoulder are all pseudocysts lined by fibrous tissue with mucoid content. Ganglia arise from diffusion through a microscopic weakness or defect in the capsule or sheath of the tendon. 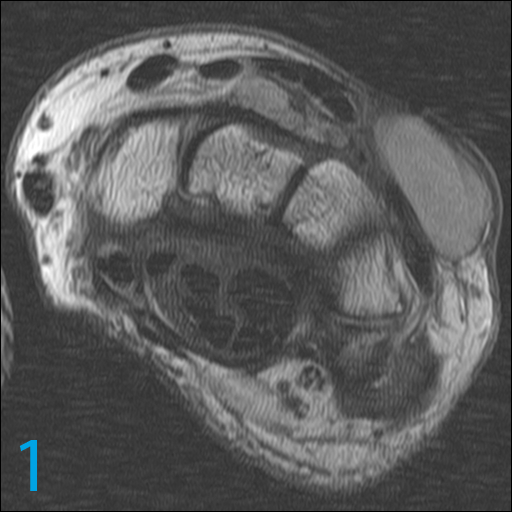 These are often difficult to visualize on MRI. Perimeniscal pseudocysts in the knee arise most commonly from a cleavage tear which usually communicates with the articular surface, but sometimes is intrameniscal and “blows out” the periphery of the meniscus. Paralabral pseudocysts arise from labral tears that are widely gaping, healed, or partially healed (i.e. the tear is not always seen). Either a perimeniscal or paralabral cyst can be macroscopic events where synovial fluid transgresses an open defect, or similar to a ganglion, can diffuse through very small defects. Frequently, the location or position of the pseudocyst is a dead giveaway to its origin; one must learn where these pseudocysts arise. 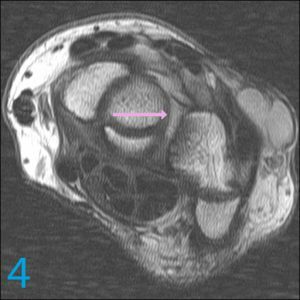 For example, in the wrist, ganglia are far more common than perimeniscal cysts that arise from triangular fibrocartilage complex (TFC) tears. 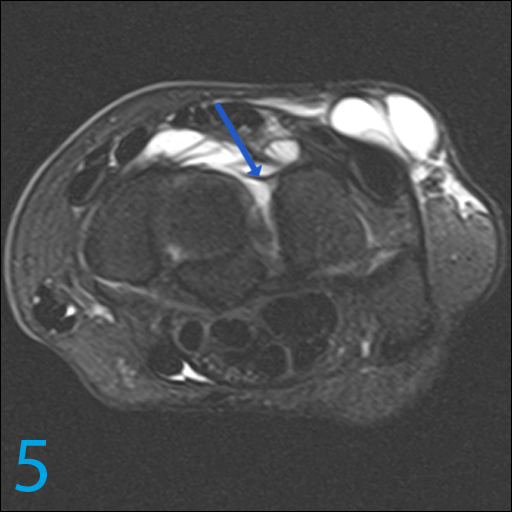 On the other hand, in the shoulder, ganglion pseudocysts are far less common than paralabral cysts arising from the superior labrum extending over the spinoglenoid rim, and involving the suprascapular notch. The arrows in images 4, 5, and 6 show ganglion pseudocysts dissecting into the lunatotriquetral interval, a much less common site of origin than the scapholunate dorsal region for this abnormality. Oversewing or repair of the dorsal scapholunate capsule and adjacent extrinsic ligaments is necessary to prevent recurrence. This will require open visualization of the area. Diagnosis: Dorsal ganglion pseudocyst with a “tail” to the lunatotriquetral capsule, and dissecting into it. 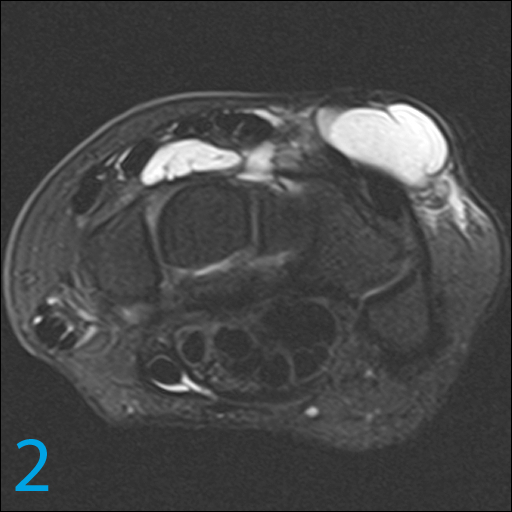 How does this 61-year-old’s wrist diagnosis differ from a young athlete’s?